Conjuring up images of lazy summer days on the river, straw boaters, and picnics, punting is on par with Wimbledon and cream teas as a quintessentially English pastime. Not only a unique way to experience a destination, punting is simply just a lot of fun. Traditionally used to transport cargo, boat punting became a popular leisure activity between 1860 and 1880 on the River Thames in London. 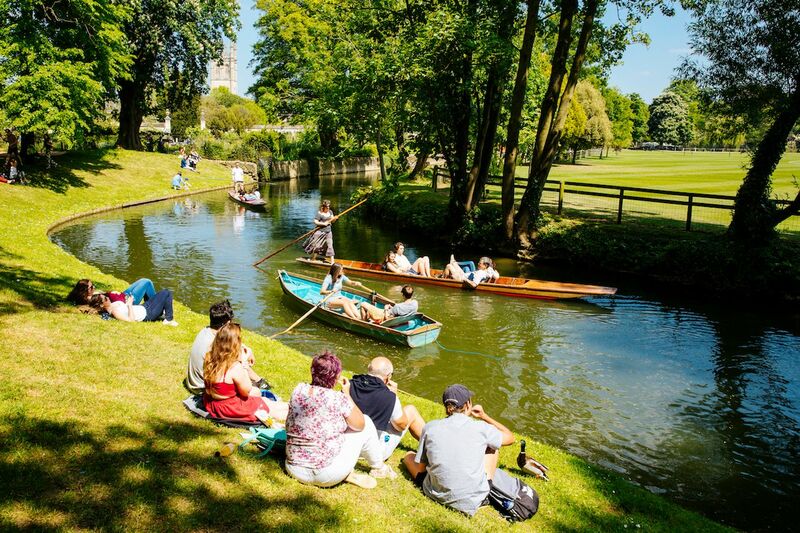 These days, punting is primarily associated with the university cities of Cambridge and Oxford, where students earn beer money by “chauffeuring” tourists along the river to take in the sights. However, Cambridge and Oxford aren’t the only places in England where it’s possible to put your punting skills to the test. In all of the following destinations, you can either hire a chauffeur or give punting a go yourself. The boats are square-ended with a flat bottom and are suited to shallow waters. They are propelled along by pushing the 16-foot-long pole against the river bed. Simply drop the punt into the water, draw it out, and do it again. Of course, it’s not quite as easy as it sounds, but with a little practice, it doesn’t take long to get the hang of it. Cambridge is probably the first place that many people think of when it comes to the activity of punting. 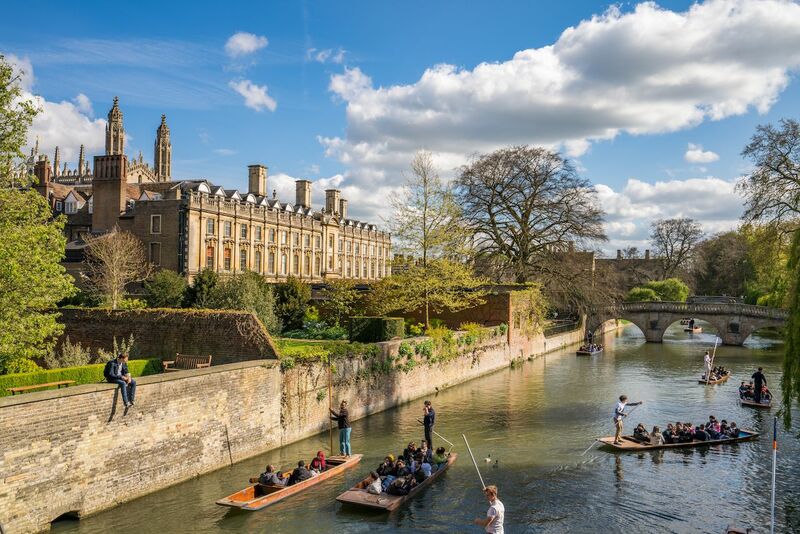 The River Cam runs through the city and passes what are known as the “Backs,” which refers to a one-mile stretch where the rear sides of some of the most prestigious and oldest universities in the country can be seen. Chauffeurs are usually Cambridge University students who can be relied upon to amuse their passengers with entertaining tales about the outlandish antics of former alumni. A few of the famous colleges that can be seen from the river include Trinity College, which was founded by King Henry VIII in 1546; Trinity Hall, where scientist Stephen Hawking studied; and St. Johns College, which was attended by poet William Wordsworth. The Backs can become congested in the summer months, but Grantchester, a couple of miles south of the city, offers a more tranquil alternative. Boats float past open meadows and woodlands, the branches of weeping willows sway over the river, and birds sing in the background. Idyllic. The River Cherwell is a tributary of the Thames and flows through the city of Oxford. Like Cambridge, the river passes many of Oxford University’s great colleges, including St. Hilda’s College, where Prime Minister Theresa May studied, and Magdalen College, where Oscar Wilde was a scholar. The Oxford Botanical Gardens can be seen from the river, and there are plenty of excellent picnic spots. Parson’s Pleasure was formerly a nudist bathing spot for Oxford Dons, or professors, and is now part of the university park. The more adventurous may wish to head for Folly Bridge, south of the city. Here it’s possible to punt along the Thames, a wider stretch of water but nevertheless shallow on the sides. One of the most scenic spots is to the west of Oxford, on the Isis next to Port Meadow, where the scenery is pretty as a picture, and you can drop into a variety of tempting country pubs. For a completely different waterway excursion, you can punt along Regents Canal in East London. Boats are available to rent between Mile End Lock and Old Ford Lock, where the sights and sounds encountered are less English countryside and more urban grit. The path next to the river is full of activity with runners, walkers, and cyclists who have escaped the busy city streets and are making the most of the relative tranquillity of the riverside. Graffiti replaces grass and trees, but one advantage of punting on Regent’s Canal is that there are plenty of pubs with gardens where you can take a break and enjoy a pint and some hearty pub grub. 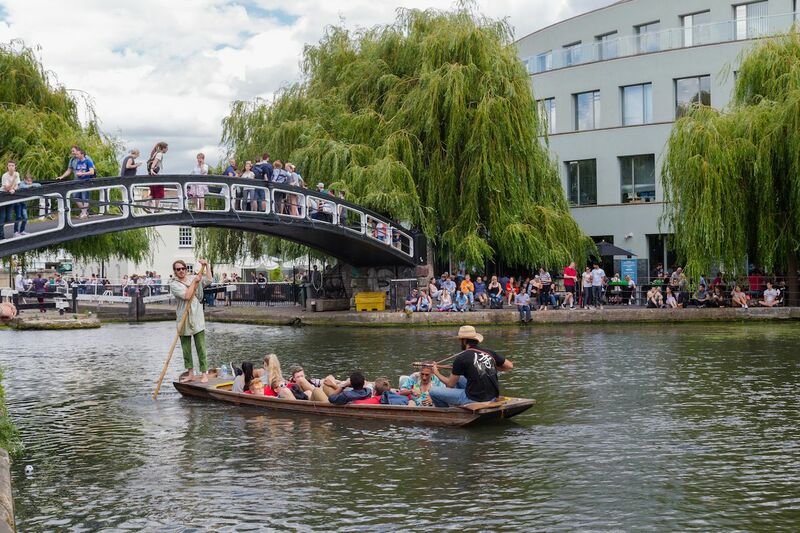 A punting trip can also be combined with a visit to the fascinating cultural melting pot of Brick Lane or Jack the Ripper’s stomping ground of Spitalfields, both located nearby. 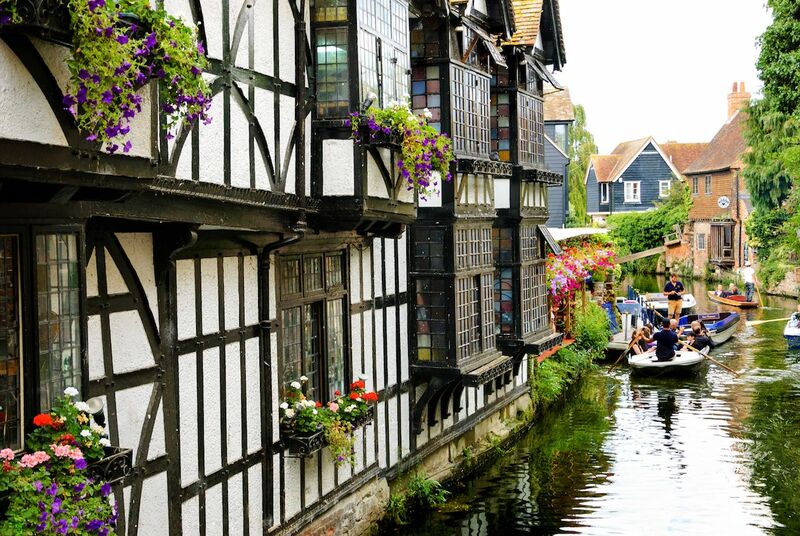 The Great Stour River runs through the heart of Canterbury’s historic city center and offers an abundance of medieval architecture, secret gardens, priories, and churches to observe as you float along. From the Blackfriars Dominican Priory, which dates back to 1237, to Greyfriars Chapel, the oldest Franciscan building in Europe, viewing the city from the river is like being transported back to another era. A chilled out countryside jaunt provides an opportunity to take in some beautiful rural Kentish scenery and perhaps even spot some wildlife. For some spine-chilling thrills, it’s possible to take a punted ghost tour at night when passengers are given an insight into the city’s spooky side. The River Avon is a picturesque waterway which is perfect for punting. Swans and ducks paddle alongside the boats, and the rural countryside is the perfect backdrop for a leisurely trip down the river. There is plenty to look at, too. The Royal Shakespeare Theatre sits on the riverbank, as does Holy Trinity Church where William Shakespeare was both baptized and buried. The lawns of Bancroft Gardens, adjacent to the theater, are where townspeople grazed their cattle back in the day. 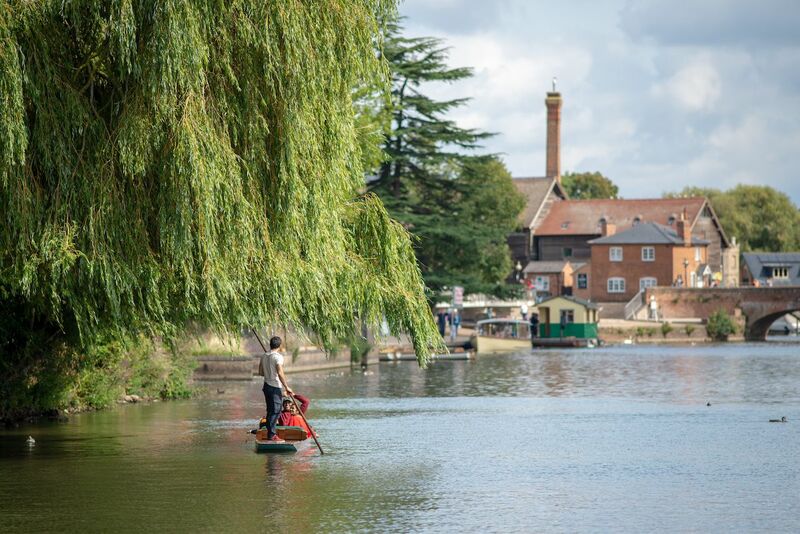 Punting along the Avon also allows river-trippers to have a peek at some stunning riverside properties and their gardens — an ideal way to enjoy a taste of Shakespeare’s home county of Warwickshire.